When I was in Madrid, I saw a lot of things. I am disappointed that I can't seem to find many of the pictures I took while there (notably the Puerta del Sol area and the Prado Museum). Madrid is pretty warm for walking around in the early afternoon but they have a great subway system for getting around and seeing the sights. 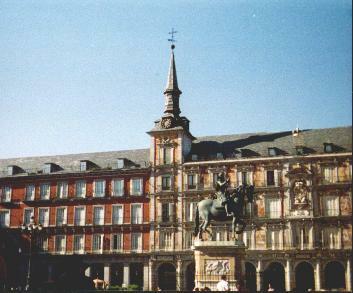 On the left is the Plaza Mayor with Felipe III on the horse who was the king that commissioned the construction. 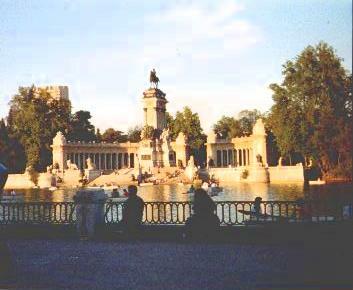 On the right is the main fountain in Retiro Park where all the locals go to ambulate and row rented boats. 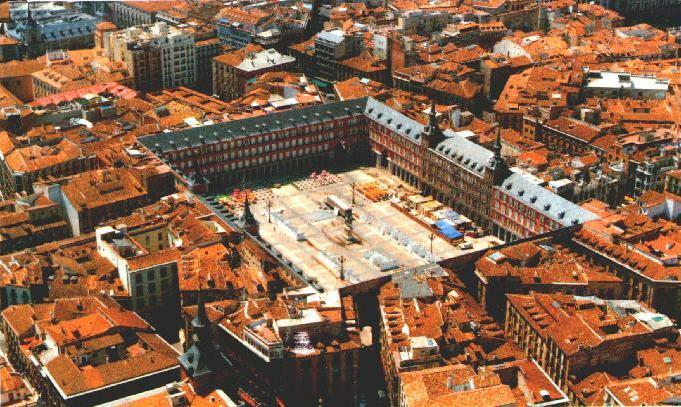 This is a bird's eye view of the Plaza Mayor. An intricate maze of shops surrounds the plaza on the ground floor. The second floor generally is reserved for office space, and floors above that are private apartments which are very expensive. I had intended to obtain a motorbike of some sort and run to all the out of the way places in Spain; however I found that the rental prices were astronomical and you could not purchase a motor vehicle of any sort in the entire country unless you showed your visa residency status issued to you from the government. So I had to tour the country by bus. This was my greatest disappointment to touring Spain.